When you figure the amount of work required to make your own movie trailer from scratch, the new movie trailers feature in iMovie ’11 is amazing. In just a few minutes, you can create a short film with production values that rival what you see on the big screen. But is that all there is to iMovie’s movie trailers? Did Apple put in what is obviously a lot of work—many of the soundtracks were recorded by the London Symphony Orchestra, for heaven’s sake—for a feature that takes a few minutes to use and creates a movie only a minute or two in length? Fortunately, the answer is no. From fine-tuning edits to customizing cast members, movie trailers offer more than what appears on the surface, including a way to use the trailer as a starting point for a larger project. The following sequence assumes that you already know the basics of creating a movie trailer. If not, consult the iMovie Help before embarking on the project below. To start with Step 1, you need to have already created a project and chosen a trailer template. First, in the Storyboard tab of the Project browser, position your mouse pointer over the scene you want to edit. 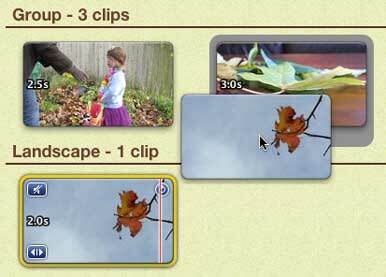 Finally, drag the active area to a new position within the overall clip. The scene’s duration doesn’t change, so all you can do is slide the highlighted area within the clip. (Here’s a tip: To quickly preview that footage, press the forward-slash [/] key.) Click Done to make the change. Double-click a clip in the Storyboard interface to bring up iMovie’s familiar Inspector, which facilitates clip adjustments such as applying video or audio effects, enabling image stabilization, and tweaking colors and audio. For example, you can set all clips to be black and white in a Film Noir themed movie trailer. Similarly, select a clip in the Storyboard and then click the Crop button in the toolbar to crop, rotate, or apply the Ken Burns Effect to the footage. Would a clip you already placed work better in another spot in the Storyboard? Just click and drag the clip to another location. If that new destination already had a clip, the new one replaces it. When you hold the Option key while dragging, iMovie creates a duplicate—helpful if you want to use a separate section of the same scene. Every movie trailer type includes cast members, but a few let you add or subtract characters; multiple soundtracks were created to accommodate the different possible numbers. In the Blockbuster, Friendship, and Travel trailers, go to the Cast list in the Outline view and click the add (+) or subtract (–) button to the right of a cast member’s name. There can be as few as two and as many as six identified characters. In the Pets trailer, use the Pet Type field to specify Dog, Cat, Horse, or even Monster. The animal tracks that appear in the text screens change to reflect the choice. The trailer becomes a regular iMovie project with all edits appearing in the Project browser—as if you had spent a lot of time building them manually.